and Jane Reilly, award committee member.(R). 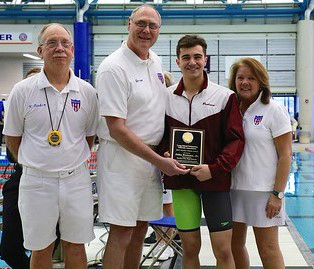 Garden City senior, John Protano Jr. was presented the Long Island Swimming Officials Association 2019 Scholar-Athlete Award. This $1000.00 award has been provided by the LISOA for over 25 years to a senior swimmer or diver who has competed for their Long Island high school during the winter season and will be attending an accredited University or College. by LISOA Vice President Ray Willie and Secretary Christine Zimmet. Jason's winning time of 4 minutes, 28.34 seconds in the 500-yard freestyle, broke the county record of 4:31.62 that he set in 2017. He also won the 100 breast with a time of 55.54. Competitor Award from association president George Fleckenstein. 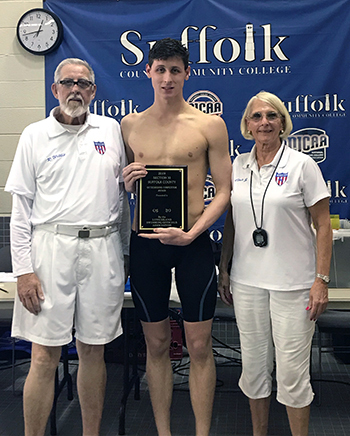 Breaking two Nassau County Boy's Swimming records, Garden City junior, Jake Newmark was selected as the Most Outstanding Competitor at the 2019 Nassau County High School Swimming Championships. Jake set two Section VIII records winning the 200 yard freestyle and the 500 yard freestyle where he achieved an All-American time. from association president George Fleckenstein. 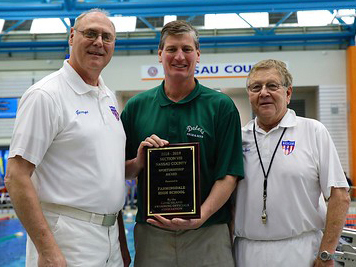 The 2019 Section XI Boy's Swimming Team Sportsmanship Award was presented to the Bulldogs of Lindenhurst High School. 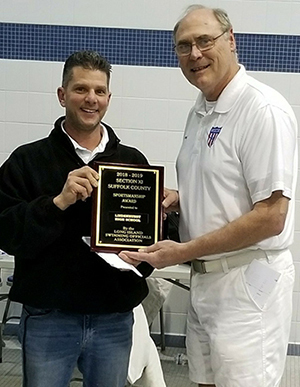 Lindenhurst was the top voted school in Suffolk County for their display of sportsmanship during the season by the members of the Long Island Swimming Officials Association. 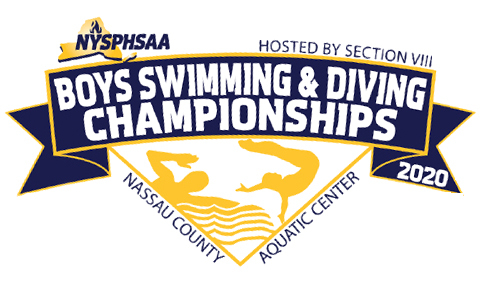 The LISOA has officiated high school swimming on Long Island since 1957 and annually presents the Team Sportsmanship Award. 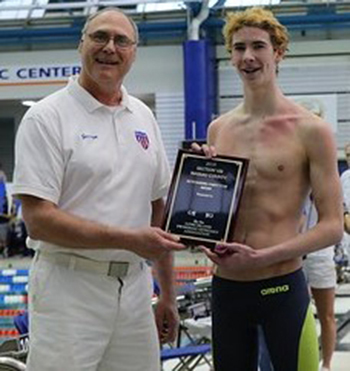 This year, Section VIII Boys High School Swimming had a tie for the Team Sportsmanship Award. Both Farmingdale and Great Neck North High Schools were honored for their impressive display of Sportsmanship during the 2018-19 season. Farmingdale High School coach Ken Ilchuk accepting the award. Presenting are LISOA President George Fleckenstein (left) and Sportsmanship chairman Doug Virkus (right). 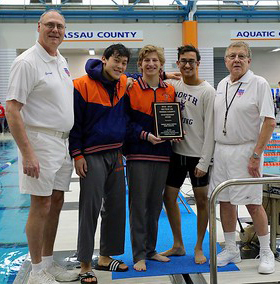 Great Neck North High School captains receive the Team Sportsmanship Award from association president George Fleckenstein (left) and Sportsmanship chairman Doug Virkus (right).